I’ve had it flagged for a long time but it wasn’t until this weekend that I finally made a batch of Galician filloas. Served year around in northern Spain, they are most popular during early winter’s carnival season. Similar to crêpes, they’re made from with the usual suspects – flour, eggs, milk – but can also be blended with stock and cooked off with bacon fat or lard instead of butter. The thin batter is poured onto a hot skillet (or a stone), flipped and filled or sprinkled with sugar and served as dessert. Hovering somewhere between sweet and savory, they can be hard to classify. The benefits of using lard are pretty well established at this point, but not all lard is created equal. I buy mine at G. Esposito and Sons Jersey Pork Store where it’s freshly rendered on the premises. The shelves are lined with enormous cans of tomatoes, and the walls are covered with religious images, family photos, and glowing reviews. Rising above the din is the lushest Italian music you could imagine. The atmosphere is Carrol Gardens, Brooklyn but the soundtrack is pure Katherine Hepburn in Summertime. 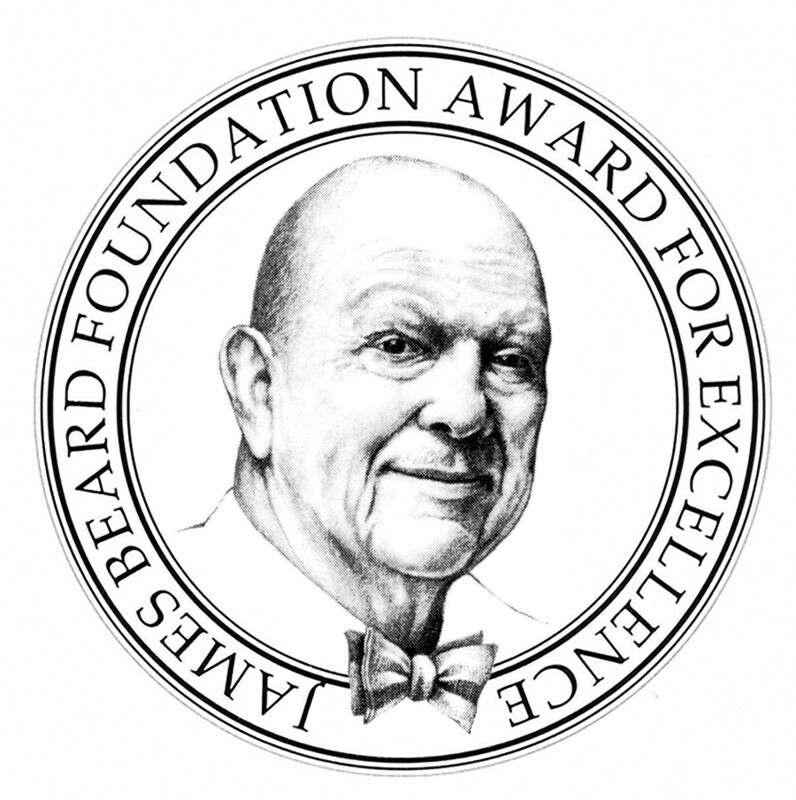 With my off-type lard melted and the batter resting, I was looking for a filling. The pork flavor may have been more pronounced if I’d used bacon fat but it was barely detectable in the lard. Still, I wanted something that would play well with the savory elements that did come through. 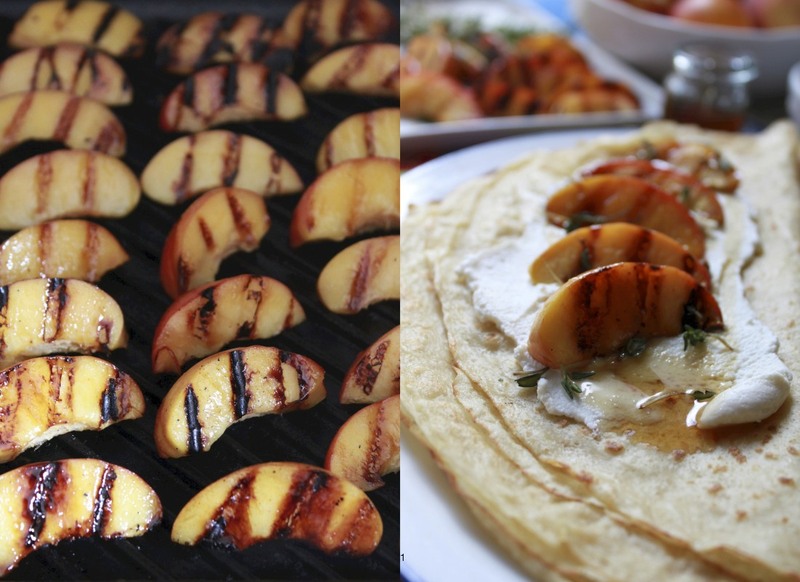 I kept it simple – nectarines tossed with honey, quickly grilled, and sprinkled with thyme. I picked up my favorite fresh ricotta nearby – another neighborhood staple item, rediscovered in the last couple of years, that was hiding in plain sight. 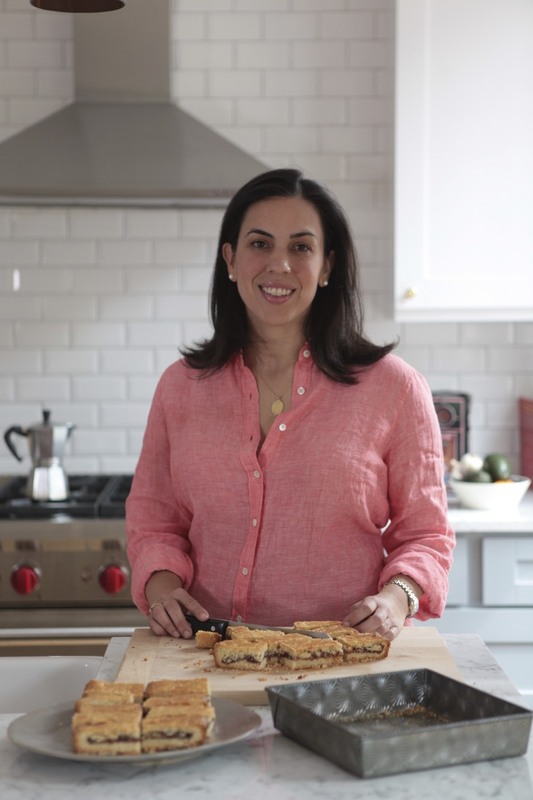 Adapted from a recipe for filloas in Spain…A Culinary Road Trip by Mario Batali and Gwyneth Paltrow. There were several online recipes that left out the chicken stock altogether but I was curious how it would affect the flavor. It was much stronger in the batter but blended in when they were cooked. They also reheated well so I was able to try them with all kinds of fillings over the next few days – preserves, chocolate, ham and cheese – but not at the same time. Filloas came to Spain via Rome so it’s understandable if Spaniards bristle when they’re called crêpes. Not only are they popular during carnival, they’re also traditional during la matanza del cerdo when all kinds of products using pork – morcilla, embutidos, chorizos – are prepared. A variation calling for pig’s blood or filloas de sangre, I’ll leave for another day and what will doubtless be a memorable trip to the pork store. Sift together the flours and salt in a separate bowl breaking up any lumps. Combine the flours, eggs, stock and milk in a blender jar. Cover and blend at highest speed for 1 minute. Scape down the sides with a rubber spatula as needed and blend for 2 to 3 seconds more. Cover and refrigerate for at least 1 hour or overnight. Melt lard in a saucepan over low heat. Set aside. 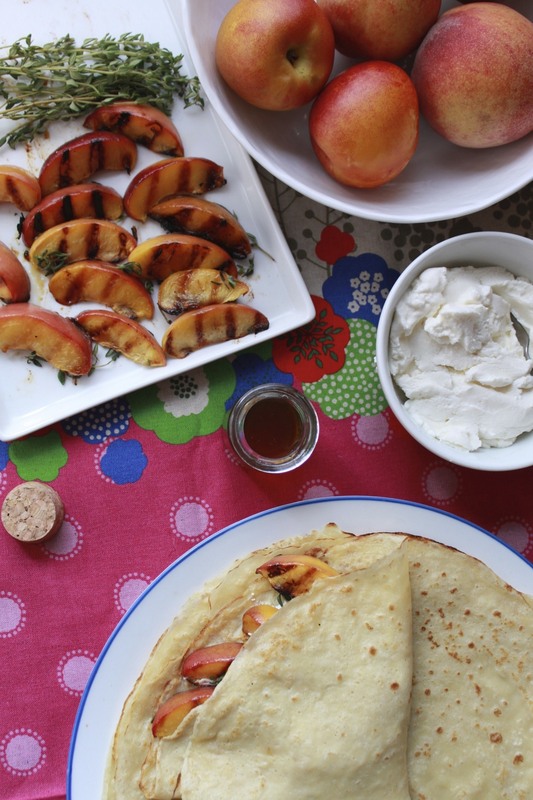 Spread crêpes with two heaping tablespoon of ricotta and sliced nectarines. Roll jelly-roll style or fold in half. *Filloas can be kept in a 200 degree oven until ready to serve. They can also be made in advance and reheated before using. If frozen, thaw overnight in the refrigerator then reheat in a 300 degree oven for 5-10 minutes. Heat a well-oiled grill pan over medium-high heat. 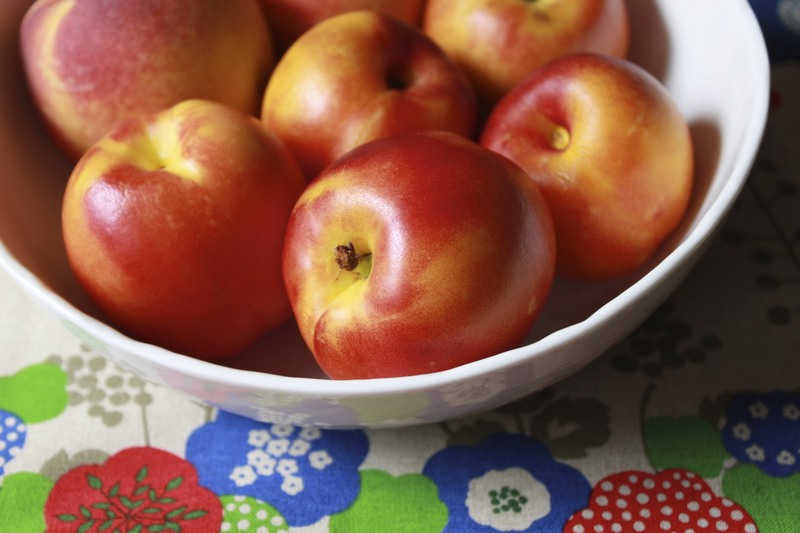 In a medium bowl, toss the nectarine slices with honey until well coated. Lay the nectarine slices on the pan in a single layer and grill until cooked through, turning once and brushing with honey as needed, about 3-5 minutes. Remove from heat. Place on serving tray and sprinkle generously with thyme leaves. Cover with foil to keep warm and set aside until ready to fill the filloas. The ingredients you chose for the filling are perfect! Well I couldn’t leave this entry of yours without a bit (LOL) of input. In France, Crepes originated in Brittany (the Celtic region of France). Unbenownst to others or not, the French don’t like to share what becomes theirs. For instance the Beret, all Spaniards know it belongs to the Basque, but you only here about “the French beret”. Correct? 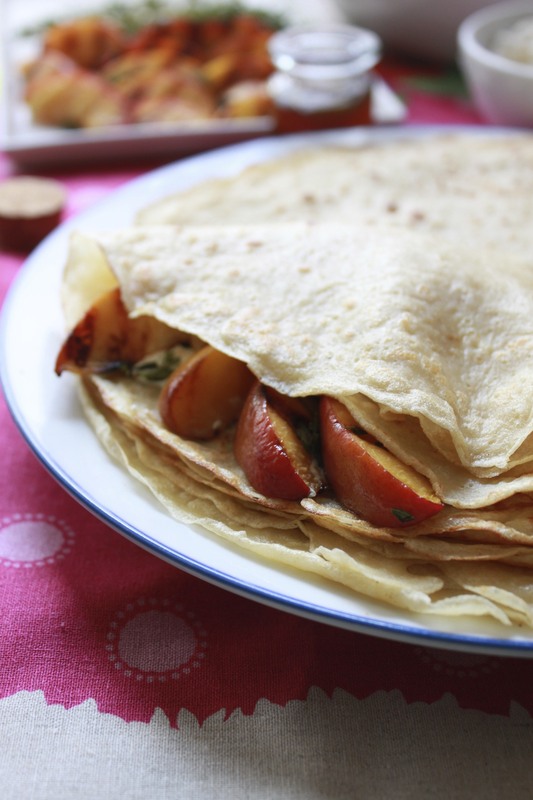 Filloas are Crepes and belong to the Celtic people of Brittany and Galicia. Anyway, Galicia is a Celtic nation (one of many nations-Ireland, Scotland, Isle of Mann, Cornwell, Brittany, Wales, Cape Breton) Some may dispute this claim but I along with many other fellow Celts know the Galician character (notwithstanding the despot character of 2 leader brothers of an island in the Carribean-Cuba. And of course Franco of Spain-but this site is not about politics.) and it is most definetely Celtic, not to mention the bagpipes, tartan cloth, folklore dance of Galicia, some foods, etc. (ALL of Celtic origin). The naysayers don’t know Galicia/Galicians so they’ll say what they like. Quiemada a very traditional ancient drink was drunk to ward off bad spirits and is accompanied by an ancient chant written in Galego (Galicia’s surviving Gaelic tongue-naysayers also claim Galego to be a dialect of Portuguese-of course this claim too is nonsense-how ridiculous to claim Galicians are Portuguese-since when?). Anyway to remain focused (what a feat sometimes) Quiemada drinking is in the realm of Halloween. As you may or may not know, Celts gave Halloween (commercialised later on of course) to the world. Well Filloas are Crepes! Yes indeed. Empanada is another Celtic food. In Cornwell, England (a Celtic nation too) it is known as the Cornish pasty-you can find it in Northern US cities where some of these people have immigrated to over time. I hope you don’t mind a bit of the historical redirection on the Roman aspect of the Filloa. FYI-although the Romans did reach Galicia their culture did not, what survives in this region of Roman influence are some of the aqueducts built. For Roman Spain as we all know we have to travel to the other side of the Spain, Catalonia and Valencia. Here we find Roman foods (not to be found in Galicia) like pine nuts, pastas. If you go to this site http://www.tartan.galician.org/kilts.htm, you can see Galician Tartan and at Galicianshop.com buy Celtic Galician items. Here http://celticland.com/ you can read the ancient chant accompanied by the ancient drink, Quiemada. If you would like a Celtic cookbook which includes Galician recipes this is it: “New Celtic Cooking” by Kathleen Sloan-McIntosh & Ted McIntosh. If you’d like to here Celtic music from Galicia buy “Santiago” a tribute by the Chieftans (a band from Ireland) to Celts in Galicia. Till next time.